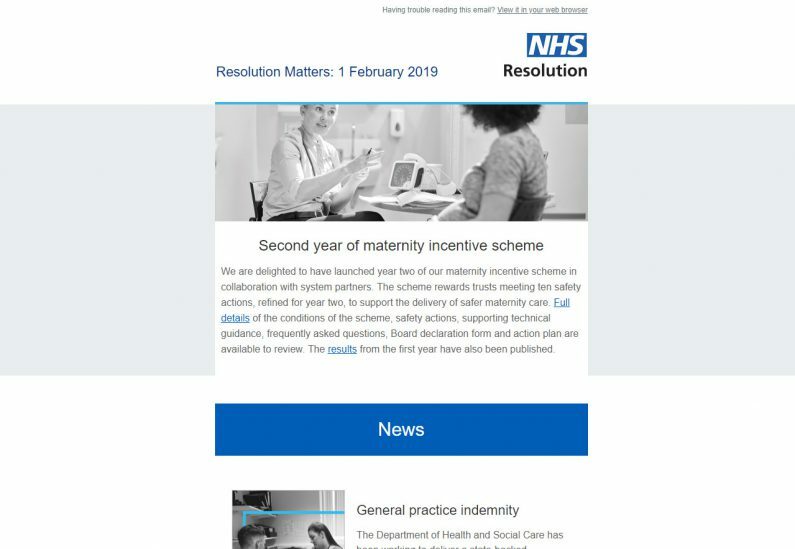 The NHS Resolution Communications team send out “Resolution Matters” a quarterly newsletter that rounds up what is new from NHS Resolution. The content is all linked back to articles, news, resources or pages on the NHS Resolution website, so the newsletter needed to give subscribers a quick snap shot of the latest developments and make it easy for readers to get further information on articles that were relevant to them. The newsletter also needed to be easy for the team to publish. The Communications team already had a HTML email template that they used to send the Resolution Matters emails using the Campaign Monitor mail broadcast system. The template contained endless options for adding content to the email, but these were hard for the Communications team to manage. For each email they sent they spent a large amount of time trying to make design choices, such as – what type of call to action blocks, what colours, what font sizes, where to put the headline. Formatting was difficult too with side-by-side content that wouldn’t easily line up and content areas that didn’t always stack well together, so if the Communications team choose a certain of types of content display, they would flow correctly together. The colours were not on brand and the colour contrast failed web accessibility standards. The template was also not responsive – leading to the email being difficult to read on mobile phones. After discussion with the Communications team we made the decision that they didn’t need (or want) to have endless design options. In fact, they only wanted to spend time providing the most important and interesting content that they needed to disseminate to newsletter readers. We assessed previously published email to work out the frequency of content types (news stories, case studies, legal rulings, training courses etc.) We then created an email that would display the content types in a flexible manner. The layout was fixed but content editors had repeater fields to hold additional content if necessary. Content editors could choose where they put the different content types within the newsletter but all design decisions were fixed within the template. The communications team had an email that displays their information beautifully, being on brand, legible and well laid out on both mobile and desktop devices. The email template is now simpler for the team to manage – meaning that they can concentrate on publishing content without spending time making design decisions or wrestling with HTML email formatting.